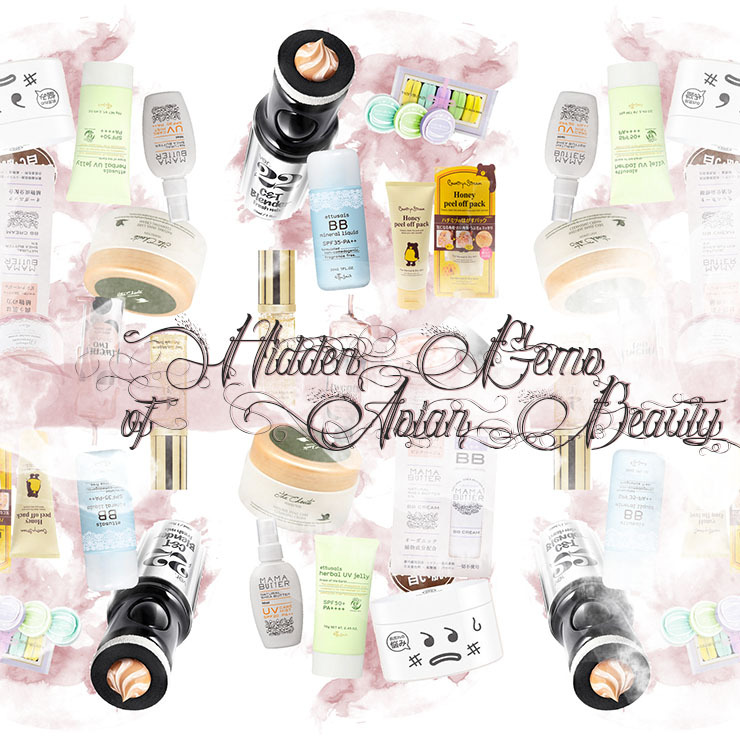 The Hidden Gems Of Asian Beauty: Into The Unknown. As diverse and colorful as most Asian Beauty products are, I sometimes feel that I've seen it all. If you've delved deep enough into Asian beauty and skincare waters there probably aren't many things that still surprise you a bit - I'm here to change that! I made it my personal mission to find some products for you that aren't among the safe and usual shores and probably light that fiery excitement again that we all felt when we first started this beauty adventure. (I might be a little bit over-dramatic here. That's just my character.) Although I am still utterly in love with brands such as Hada Labo or COSRX which have been to amazing service of my skin, I sometimes want to be a bit more adventurous and jump right into the unknown. However, there are plenty of glittering fish in the beauty sea! I browsed all the online shops that I know of and searched for the most unusual/exciting products from Japan, China and Korea for you to enjoy! If you know of any lesser known/underrated Asian brands or skincare products please let me know! Note: I haven't used any of these products (yet) except for Ettusais, Country & Stream and Mama Butter. "Hidden Gems" in this context refers to products that I found exciting because of their ingredients, purpose or packaging. Products from left to right; top to bottom. My friend Moi Sanom showed me this product when we were debating "exciting products we'd like to try" and she came up with this ampoule that is supposed to be used as a base/primer underneath make-up and is actually supposed to be a dupe for the infamous Guerlain L'Or Radiance Concentrate with pure gold. How exciting is that?! Cleansers never excite me despite being a crucial part of my daily skincare routine. I never go "oh, let's find an exciting new cleanser!" No. It just doesn't work like that. This cleanser however, excites me. The fusion of perfect dotted-packaging combined with a rarely seen ingrediengt such as agave syrup makes this a cleanser I actually really want to get my hands on. I have a really weak spot for Ettusais packaging in my heart; just look at it! They make everything look cute yet still kind of high-class. I want everything in my bathroom and I definitely want Premium Amino Caviar on my face. Lots of it. First of all: There is never enough snail in my routine. On top of that, the combination of snail mucin and shea butter just melts into a really buttery cleansing experience in my brain which is enough to make me lust after this big time. I have tried this BB Cream when I lived in Japan and damn, it has some great ingredients in there. It has a very strong lavender scent though, so if you are sensitive to fragrance, you should stay away from this product. It did have great coverage though so for everyone out there battling acne as I do - this could be just for you. This has only SPF20, but I think this would be a great addition to when you're outside in the city and want to quickly add to your sun protection. Plus, this is 90ml and will probably last you longer than some of these other tiny Asian sunscreen bottles you probably are hoarding at home. Nothing sounds more amazing in my ears than the combination of UV and Jelly, ah. I already imagine some goopy hydrating jelly goodness in my skin that on top of that, will also give me great sun protection at SPF50 and PA++++. I will definitely get this the next time I'll be in Japan! If this wasn't so incredibly hard to come by in Europe, I would have already tried out these little jars that promise skin renewal. Mandelic acid is said to be probably the most gentle out of all the chemical exfoliating agents out there and since there is no MUAC available where I live, this would be the thing I'd jump on if the opportunity arises to try out.